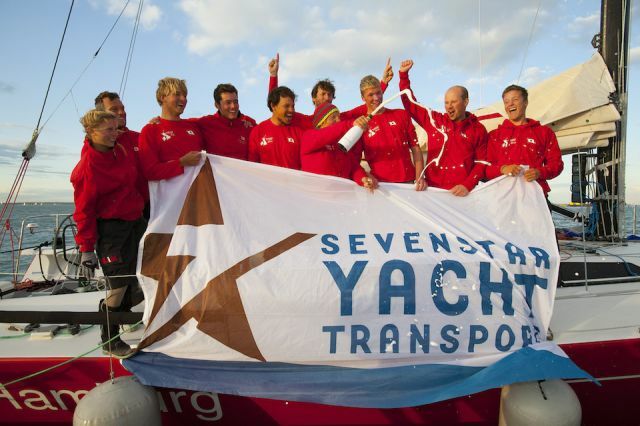 Swish, skippered by Canadian Roderick Knowles, crossed the finish line of the 2014 Sevenstar Round Britain and Ireland Race off the Royal Yacht Squadron, Cowes at 04.06.49 BST on Wednesday 20th August 2014 with an elapsed time of 8 days, 19 hours, 06 minutes and 49 seconds. Subject to ratification by the World Speed Sailing Record Council, this breaks the previous World Record for Monohulls 40 feet and less, set by Concise 2 in 2010, by over 18 hours. This will be the fifth World Record broken during the 2014 Sevenstar Round Britain and Ireland Race organised by the Royal Ocean Racing Club. Celebrating dockside with his crew, Roderick Knowles spoke about the record breaking 1800 mile lap around the British Isles and Ireland. "We knew that we were the only Class40 left in the race and from that moment on, our only goal was to finish the race. So to break the record is just fantastic. Right out of the blocks we had tough conditions and it was painful, several competitors set off at full speed with masthead kites but we were more cautious, up until we got to about half way up the coast of Scotland we had 30 knots of wind most of the time. It was quite a pleasant reach around Muckle Flugga but the toughest conditions were on the approach to St.Kilda, we hoved to for a few minutes and put the storm sails on. "I have a very small number of miles compared to the crew, so for me it was an enormous learning experience. Nick (Legatt) as navigator, was excellent and I have learnt so much from his seamanship. But when it comes down to it, it was just four blokes, the youngest is 40, so we didn't argue about anything or take anything personally. The atmosphere was very relaxed on board and I didn't hear an ill-word all trip. It is incredible and really cool that we beat the world record by over 18 hours, I have never held a world record before." Swish's South African navigator, Nick Legatt, has broken a world record on the course before as part of Steve Fossett's Playstation crew in 2002. Legatt has sailed round the world three times and crossed the Atlantic 34 times. "I have raced across the Atlantic at various latitudes and they all pose different challenges, this race is far more intense in terms of weather, we had three different weather systems to contend with. Also the effects of the land are very significant in this race, which you don't get crossing an ocean. We did have some communication issues on Swish, which meant we had no weather data once we left and we used the barometer and our eyes to decide on what was coming next. There were many discussions on board about cloud shapes and air temperature, so it was really a bit old school. This is a very unique race, it is a pity the RORC only run it every four years." Yesterday afternoon Custom JV52, Haspa Hamburg, finished the race to claim second in IRC Zero. Skipper Katrin Hilbert was full of praise for the young crew, all members of the German yacht club, Hamburgischer Verein Seefahrt. "The average age is 25 and we have two crew who are 19 years of age. I am so proud of them, even when we had some really bad weather and when we had some problems on board, we held together as a team and supported each other. We will be celebrating tonight with some good food and a few beers and then we will sail back to Germany in the morning to continue racing in the Baltic for the rest of the summer. Many thanks to the RORC for organising a fantastic race and making us feel so welcome, we will definitely be returning." At 0900 BST on Day 10 JV53 Bank von Bremen, skippered by Carol Smolawa, is just 18 miles from the finish and is expected to be the 12th yacht to finish the Sevenstar Round Britain and Ireland Race and claim third place in IRC Zero. In IRC One Hanse 53, Saga, skippered by Peter Hopps, passed the Fastnet Rock in the early hours of Wednesday morning 390 miles from the finish. In IRC Two there is a tremendous battle between J/122, Relentless on Jellyfish, skippered by James George, and J/111, British Soldier, skippered by Phil Caswell. Relentless on Jellyfish is sixteen miles behind the Army Sailing Association's British Soldier but leads on handicap by just 50 minutes. The Irish Two-Handed team, Liam Coyne and Brian Flahive racing First 36.7, Lula Belle, spoke with the RORC Media Team as they approached the Irish Coast on Tuesday evening. "We are just off County Mayo, were I was born," said Liam Coyne. "All is well on board but we only have the A5 kite left, the other two are trashed and the mainsheet track has come away from the deck but it is nothing a bit of Irish engineering couldn't solve, I just hope it holds out. We are determined to finish this race but being so close to home makes us really want to get on with it." 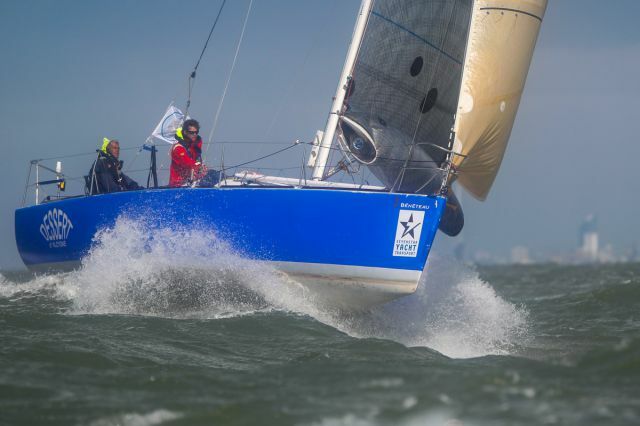 The British Two-Handed team, Ian Hoddle and Conrad Manning racing Figaro II, Rare, have increased their lead over the German Figaro team, Dessert D'Alcyone, skippered by Werner Landwehr with crew Heiner Eilers. Rare is now 45 miles ahead, a gain of 25 miles over the last 24 hours. At 0900 the two Figaros were experiencing light winds off the north west coast of Ireland but Conrad Manning was unaware of the 24 hour gain. "Awesome sight!" exclaimed Conrad by text message. "We have four dolphins for company, it's the first time we have entertained guests for over a week. Dolphins are a common sight for offshore sailors but they are always fascinating to me. Like us they have a passion for being out here and love to play! However, this has become a race of two weather conditions. After being beaten up a few days ago, we are now in a 'driftathon' and we are getting tired of the slapping of the mainsail and the crinkling of the kite. I hope our rivals are not too close behind."